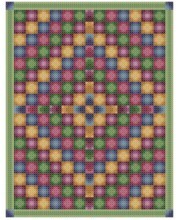 This cross stitch quilt pattern was inspired by my daughter. She recently completed her first quilt using the Trip Around quilt pattern. For this cross stitch quilt pattern, I used a whimsical, light hearted color palette to celebrate my daughter's accomplishment. With Supplies: $23.60 You download the design. We will send you, 18 skeins of DMC Floss & Wichelt 14ct. 18" x 21" Aida (Ivory) to complete your project.